T'Pol was born to T'Les and her husband in 2088. As a child, T'Pol was betrothed to a Vulcan named Koss; their marriage was due to be conducted in adulthood. Raised in a house near the capital city on Vulcan, young T'Pol had and cared for a pet Sehlat. She was also told about family secrets not recorded by her second foremother, T'Mir, regarding a duration in which she stayed in Carbon Creek, Pennsylvania after crash-landing nearby in 1957. T'Mir had kept her Human purse from Earth and it had become a family heirloom. During one particular period of her early career, T'Pol operated as an agent with the Vulcan Ministry of Security and gained associates within the Klingon Empire who would later help her locate a Klingon penal colony, Rura Penthe. One of her first assignments for the Ministry was to retrieve seven rogue agents who refused to return to Vulcan. Managing to capture five of the seven she was assigned to locate, T'Pol tracked agents Jossen and Menos to Risa in 2135. There, she killed Jossen but was unable to capture Menos. T'Pol thereafter underwent the Fullara ceremony at the sanctuary of P'Jem, which erased her memory of having killed Jossen, along with any associated emotions. Later in her life, T'Pol served the Vulcan High Command's Science Council aboard the starship Seleya. She acted as the ship's Deputy Science Officer, working under Captain Voris and alongside Chief Engineer Commander Solin. T'Pol also worked with the Vulcan military during the Tomed mission, at which Talok was under her command, as well as for the Ministry of Information on Vulcan. In 2149, T'Pol was assigned to Earth, both as an ambassador to the United Earth government and as an aide to Ambassador Soval. She resided in the Vulcan Compound in Sausalito, where she formed a strong working relationship with Soval. Like him, she believed that Humans were too "volatile" and "provincial" to leave their solar system. By that time, she had already been on thirty-six different Minshara class planets. One night in 2150, T'Pol left the Vulcan Compound and went south to stroll the streets of San Francisco. Overhearing "unusual, chaotic" jazz music piqued her curiosity so she entered the Fusion night club, where the music was being performed, and listened to the saxophonist there. The experience elicited an emotional response that she subsequently never forgot. Sometime during her stay on Earth, T'Pol took a five-day leave to visit Carbon Creek and see it for herself. After Earth accidentally made first contact with the Klingon courier Klaang in April 2151, T'Pol was reassigned to the Earth Starfleet vessel Enterprise with the rank of sub-commander. She acted as "chaperone", in exchange for the Vulcan provision of star charts and the Klingon linguistic database, but was not immediately accepted by the crew. She was referred to as a "spy" by the ship's chief engineer, Commander Charles Tucker III. During an ensuing mission to return Klaang to his homeworld, however, T'Pol accompanied Captain Jonathan Archer and a landing party to the trade complex on Rigel X. There, she used her prior experience with alien cultures to lead the Humans through much of the investigation. She subsequently took command of Enterprise, when Archer was incapacitated, and anticipated the captain's wishes, pursuing the investigation despite her personal belief that it was a "foolish mission." Upon the captain's recuperation, T'Pol aided Archer both in uncovering a plot by the Suliban Cabal to destabilize the Klingon Empire and successfully returning Klaang to his people. T'Pol was persuaded by Archer to remain aboard, following the conclusion of the mission, at which time she took the position of science officer and the title of first officer of Enterprise. In her first capacity as a member of the crew, T'Pol led a survey team in exploring an uninhabited M-class planet not far from Earth. She and her team were exposed to a powerful hallucinogenic toxin from the local plant life and consequently began to experience severe paranoia. Taking refuge from a powerful storm, she maintained much of her composure as her Human companions became lost in delusion. In communication with Archer aboard Enterprise, T'Pol used playacting to get numerous members of her team – namely, Commander Tucker, Ensign Travis Mayweather, and Crewman Elizabeth Cutler – through the night, though she was forced to use a Vulcan nerve pinch on Ensign Mayweather. On June 19, 2151, T'Pol accompanied Archer and Tucker on a visit to a Vulcan monastery at P'Jem. Finding it overrun by Andorian commandos under Thy'lek Shran, T'Pol and the two other officers from Enterprise were taken captive. Shran insisted that the Vulcan government was hiding a sensor array in the monastery to spy on Andoria and refused to release his hostages. During an escape attempt, T'Pol uncovered a hatch leading to a secret facility, unknowingly exposing the Vulcans' duplicity. She was instructed by Captain Archer, who was incensed by the deception, to hand her scanning device – which contained detailed scans of the array – over to the Andorians, who proceeded to destroy the sanctuary. As Enterprise continued to explore space, the Vulcan High Command assigned at least one vessel to monitor the ship's activities. One of those vessels, the starship Ti'Mur under the command of Captain Vanik, began secretly transmitting personal messages to T'Pol, regarding her betrothal to Koss and obligation to return to Vulcan. During a "comet walk" on the surface of Archer's comet, Lieutenant Malcolm Reed and Ensign Mayweather were trapped in an ice collapse. After persuading Archer, T'Pol contacted the Ti'Mur and enlisted the aid of Captain Vanik, to whom she declared her intention to stay aboard Enterprise. Following the destruction of the monastery, the Vulcan High Command chose to blame T'Pol and ordered that she be recalled to Vulcan, dispatching the starship Ni'Var under the command of Captain Sopek. During what would have been her final mission, T'Pol and Archer were captured by Coridan rebels but escaped in time to prevent the death of Sopek. T'Pol was injured, during a firefight, so she returned to Enterprise while Sopek departed to dissuade the High Command of their initial orders. Early in 2152, T'Pol and her crewmates re-encountered the Suliban and were framed for the destruction of a settlement on Paraagan II, an incident that had resulted in the deaths of 3,600 colonists. T'Pol was instrumental in proving the crew's innocence, detecting a cloaked Suliban device and helping in the retrieval of data disks from a Suliban vessel. Upon the disappearance of Captain Archer and capture of Enterprise, T'Pol led the crew in retaking the ship, successfully freeing it from a Suliban helix. During this incident, T'Pol was tortuously interrogated by Suliban commander Silik for information regarding the "Temporal Cold War." T'Pol cited the Vulcan Science Directorate's findings, steadfastly maintaining that time travel was impossible. Suffering no lasting effects from the experience, T'Pol was able to convince Ambassador Soval and Starfleet to continue Enterprise's mission, upon the safe return of Captain Archer. Later that year, T'Pol used her prior combat training to teach settlers, of a deuterium mining colony, evasive techniques to repel Klingon marauders. She instructed the colonists and members of the Enterprise crew in Vulcan methods of self-defense, in a successful effort. In August of 2152, T'Pol's Vulcan physiology left her the only crew member conscious aboard Enterprise when it encountered a debilitating trinary star system. She was left alone to save the ship but was able to revive Captain Archer, long enough to help him pilot Enterprise through the system and away from a black hole. Seventeen years after her initial stint with the Ministry of Security, T'Pol once again found herself in pursuit of the rogue agent Menos. She now managed to trace him to Pernaia Prime, but began to doubt her mission and the guilt of Menos. Overcoming those doubts, however, she was able to prove that he was indeed a weapons smuggler and succeeded in apprehending the fugitive. T'Pol contracted Pa'nar Syndrome, a deadly neurological disease, from her less-than-voluntary mind meld with Tolaris the previous year. During a bid to gain more information on the disease, Phlox unwittingly 'outs' T'Pol to the Vulcan doctors at the Interspecies Medical Exchange who threaten to reveal her status to the High Command and have her recalled as those who are infected are stigmatised in Vulcan society. Archer demands a hearing but T'Pol refuses to admit she became infected during a violation, not wanting to justify their prejudice. To save her, Dr. Yuris - the youngest Vulcan doctor - declaring himself to be among the minority and informs the others of the involuntary mind-meld. With tensions between Vulcan and Andoria continuing to mount – following the incident at P'Jem – T'Pol accompanied Captain Archer and Ambassador Soval to the planet Paan Mokar, to mediate a territorial dispute. The group came under fire and crashed on the surface of the planet, where T'Pol helped Archer to protect the ambassador from further attack. Ultimately helping bring about a cease fire on the planet, the efforts of T'Pol and Archer allowed negotiations to commence. Following the Xindi attack on Earth on April 24, 2153, Enterprise was recalled home and underwent a major refit in preparation for a mission into the Delphic Expanse. Because this mission was seen by the Vulcan High Command as being an Earth matter, Ambassador Soval ordered T'Pol to return to Vulcan to be reassigned to the Ministry of Information. It was expected that, after a brief time at the Ministry, she would be allowed to return to Earth to continue her diplomatic duties. However, T'Pol resisted. As Enterprise set course for Vulcan to deliver T'Pol home and proceed to the Expanse, she abruptly resigned her commission and chose to remain aboard. As a civilian member of the crew, T'Pol retained her position as science officer and second in command, without the rank of sub-commander. She and Communications Officer Ensign Hoshi Sato worked to decipher the acquired Xindi database, shortly after the commencement of Enterprise's mission to find the Xindi and prevent a second attack on Earth. 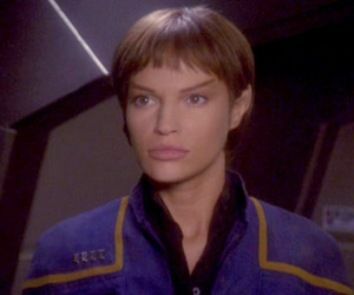 When she, Captain Archer, Lieutenant Reed and Ensign Sato were exposed to a virus on an Expanse planet, T'Pol's Vulcan immune system slowed the disease's progression, allowing her to help her crewmates through the experience and aiding Denobulan Doctor Phlox's efforts to synthesize an antidote. Not long after their arrival in the Expanse, the crew of Enterprise located T'Pol's former ship, the Seleya, which was caught in a trellium-D asteroid field. She, Archer and Reed took a shuttlepod to rendezvous with the Seleya, where they found the ship's surviving crew suffering from severe dementia and homicidal rage. Discovering Commander Solin among the survivors, T'Pol was unable to reason with her former shipmates and simultaneously found herself succumbing to feelings of paranoia and anger. She started to lead Archer and Reed through the damaged Vulcan vessel to find an escape route, but began to suspect that Archer meant to murder the ship's Vulcan survivors and refused to cooperate. As the group neared escape, T'Pol became violent and was stunned by Archer until she could receive treatment aboard Enterprise. Doctor Phlox managed to treat T'Pol for exposure to trellium-D found aboard the Seleya, determining it to be a powerful neurotoxin that affected only the Vulcan nervous system. This finding, however, meant that the substance could not be used to shield Enterprise from spatial anomalies that were inherent to the Expanse. T'Pol understood the importance of Enterprise's safe completion of the mission and therefore urged Archer to leave her behind, but the captain refused. Still skeptical of time travel, T'Pol's position on the Temporal Cold War was finally upended when she and Captain Archer visited Detroit of the year 2004. They were aided by temporal agent and former Crewman Daniels upon their visit to the past, into which the pair of Enterprise officers had traced several Xindi-Reptilians. Together with Archer, T'Pol prevented the Xindi invaders from releasing a bio-weapon on Earth and exposed the involvement of the Xindi's gods, the Guardians. T'Pol later used information, provided by Andorian Commander Shran, to study a prototype of the final Xindi weapon, tracing its construction to a planet called Azati Prime. En route to Azati, Enterprise encountered a planet containing a crashed Xindi-Insectoid vessel. Captain Archer made an attempt to investigate the ship but became altered by a chemical toxin, making him unwilling to abandon an Insectoid hatchery and jeopardizing the mission. Acting in collusion with Tucker and Reed, T'Pol led a mutiny to take control of Enterprise and forced Archer to receive treatment. Upon arrival in the Azati Prime star system, Archer set out alone to destroy the Xindi weapon, in what was presumed to be a suicide mission, but he was captured and tortured by Xindi-Reptilians. T'Pol meanwhile commanded Enterprise in a defensive battle against a fleet of Reptilian warships. Enterprise took severe damage and was nearly destroyed in the encounter but managed to escape with severe casualties. Suffering withdrawal from trellium-D, T'Pol worked to restore the ship to operation, when Archer was returned by Xindi-Aquatics. He acted against her advice by resolving to attack an alien vessel for much-needed supplies. T'Pol resumed command of Enterprise to conduct this battle and managed to do so in a precise manner, the short conflict resulting in minimum damage on both sides. Despite making what appeared to be a full recovery, T'Pol continued to experience the aftereffects of her exposure; she was haunted by nightmares and residual instability, occasionally becoming emotional and even violent. In the hopes of further releasing her emotions, T'Pol secretly developed a method of injecting small doses of trellium-D directly into her bloodstream. By February of 2154, T'Pol had become addicted to the substance, finally admitting her condition to Doctor Phlox, who aided her in withdrawal. However, prolonged exposure to the substance permanently damaged T'Pol's ability to fully control her emotions. As a two-pronged final attempt at preventing the release of the Xindi weapon and destruction of Earth, T'Pol and the Enterprise crew were ordered to destroy the Guardians' (or Sphere-Builders') devices, while Archer and allied Xindi intercepted the weapon at Sector 001. T'Pol and Commander Tucker took Enterprise to Sphere 41 – a central location where they succeeded in destroying the entire sphere network, thus dissipating the anomaly fields and thermobaric barrier that formed the Expanse. With Archer missing – though successful in his mission to destroy the Xindi weapon – T'Pol commanded Enterprise during the journey back to Earth. With the entire crew unsure of the future, she considered formalizing her own service with Starfleet. She along with the Enterprise was transported to the year 2379 and a different quantum reality. Upon arriving in 2379 T'Pol's service with Starfleet was formalized with her being assigned the rank of Commander. She was also cured of her Pa'nar syndrome.